"The Patterson-Gimlin film is widely regarded as one of the strongest pieces of evidence for the existence of sasquatches. "The footage was obtained in a remote mountainous area in northern California in 1967. The two men involved were Roger Patterson and Bob Gimlin. Patterson was a rodeo rider from Yakima, Washington. He was trying to make a documentary about the bigfoot mystery when he went down to northern California with a rental 16mm movie camera after hearing about numerous tracks in the valley around Bluff Creek. "The footage has been repeatedly analyzed by scientists over the last 40 years. It has never been proven to be a hoax, yet various individuals have "confessed" to being the man in the costume over the years. All of the confessions contradict each other, and are strongly suspected of being hoaxes themselves. No one has ever brought forward the actual costume involved, and no one has ever been able to create a matching costume, though many have tried. "The difficulty in creating a matching costume has to do with the limb ratios. The figure in the footage has shorter legs and larger arms, proportionally, than a human. 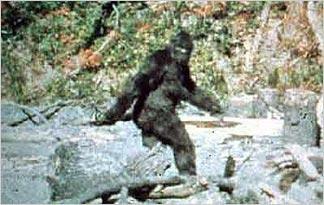 The differences are most apparent when the figure is juxtaposed to the figure of a human in a bigfoot costume." Content courtesy of the BFRO.